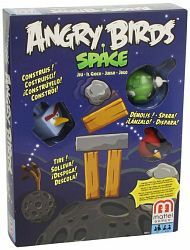 Build, blast and lift-off in Angry Birds Space style with the Angry Birds Space Planet Block Version Game! Players still try to build structures indicated by the cards before opponents can knock them down, but a planet launcher and construction pieces allow for exciting variability and play. The Angry Birds Space Planet Block Version Game features birds and pigs from one of the best-selling digital smartphone apps.